This coming week will mark the twenty-fifth anniversary of the death of Gov. George S. Mickelson. On April 19, 1993, Governor Mickelson was returning from Cincinnati, Ohio, where he had been meeting with the owners of the John Morrell packing plant in Sioux Falls. The plane crashed near Dubuque, Iowa. On board with Mickelson were Roland Dolly, commissioner of the Governor’s Office of Economic Development; Ron Reed, director of the State Office of Energy Policy; Angus Anson, general manager for Northern States Power in South Dakota; Dave Birkeland, president and CEO of First Bank of South Dakota; Roger Hainje, president of the Sioux Falls Development Foundation; and state pilots Ron Becker and David Hansen. Losing Governor Mickelson was a shock for every South Dakotan, and many knew other passengers as well. I had attended country school with Roger Hainje and our families were good friends; in fact, his younger brother was the best man in my wedding. Dave Birkeland had given me my first job in banking when I returned to Sioux Falls after law school. 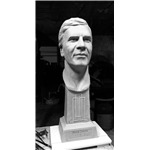 This year, the South Dakota State Legislature voted to commemorate the twenty-fifth anniversary of Governor Mickelson’s death with a bronze bust of Mickelson, to be placed in the State House of Representatives lobby. 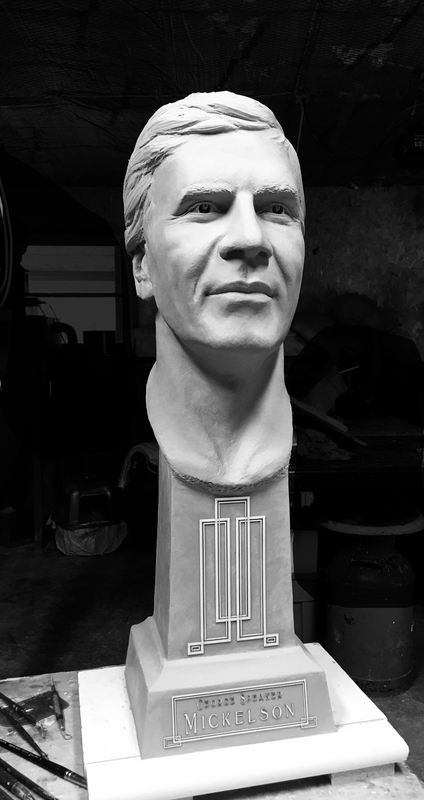 Spearfish sculptor James Michael Maher displayed his clay bust in Pierre last month, and the bronze cast will be placed in the Capitol later this year. The House lobby is a very suitable location for the Mickelson bust. Mickelson had been speaker of the house before he was governor. In fact, his middle name was “Speaker,” because when he had been born in 1941, his father, George T. Mickelson, was speaker of the house. During the past two sessions, his son, G. Mark Mickelson, has served as speaker. The Mickelson bust will “bookend” a bronze bust of Peter Norbeck, another great South Dakota governor who is memorialized in the State Senate lobby. South Dakota will never forget the tragic events of April 19, 1993. I hope, however, that we will also remember the example of public service set by George S. Mickelson and those who died with him. That is their true legacy to our state.